According to the American Diabetes Association, more than one-quarter of the adults in America over the age of 65 have diabetes (types 1 or 2), and approximately one-half of older adults have prediabetes. Among the aging populations, type 2 diabetes is an increasing problem. A disproportionately large number of the newly diagnosed diabetics are elderly. Knowledge is Key. Educate yourself about diabetes so that you can assist your loved one. There are so many misconceptions about this disease, so arm yourself with the facts. Diabetes is a disease that can be successfully managed with the right care. Find information from reputable sources like the American Diabetes Association. Offer to attend medical appointments with your parent or diabetes management classes. You will have a learning curve, but it is something that you can face together. Take a Deep Breath. Your instinct may be to run in and immediately try to fix it. Your parent is an adult, and they will need time to come to terms with the trauma of their diagnosis. You need to give them time to grieve and overcome their disbelief. Understand that they are under a lot of stress. They may even resist your help in the beginning. Allow your parent some autonomy, if possible. Remain unemotional when discussing this topic but always supportive. Don’t overwhelm them with too much information. And don’t try to police their eating habits or care. Can Your Parent Care for Themselves? If you parent is already frail, has poor eyesight, or has little mobility or hand dexterity, then this diagnosis may be overwhelming. Perhaps they need a blood glucose meter with a larger display to read clearly or help with the weekly grocery shopping. Work with their physician on how to overcome limitations so they can self-care and remain independent. Perhaps, make a chart of their medication or purchase pill boxes to help organize their daily medications. 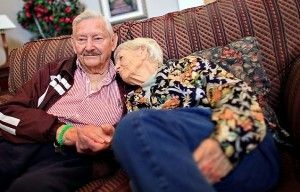 If they are not able to manage everything on their own, this may be the time to consider moving them into an assisted living community. An assisted living community can assist with their care, monitor their health, provide better nutrition, prepare meals, and encourage exercise. Your parent will also be less isolated and emotionally supported. Slow and Steady Changes. Especially for an elderly parent who is diagnosed with diabetes, it is better to make continuous small changes. Don’t try to revamp their entire diet within a day or throw them into a rigid exercise routine. This could do more harm than good. Start by purchasing a new set of measuring cups to help with portion control. Shop together for items on their meal plan. Find new recipes and make dinners together. Offer to walk together. Help them make healthy changes but have the patience to make these changes slowly. The good news is that in older adults small changes can show significant benefits.